The Divine Shakti Foundation is dedicated to providing for the holistic well-being of women, their children, orphaned and abandoned children, and all of Mother Earth. DSF is working to identify needs and design and implement programs to support women and children (especially orphaned and abandoned children) to be socially and financially self-sustaining, as well as raise awareness of the problems facing women and children through education and mass communication. DSF is also engaged in activities for the preservation of Mother Earth, especially protecting the Holy Ganga River and providing a safe and natural environment for India’s revered cows. Further, DSF supports and promotes cooperation and association among the people who are interested in these divine goals. Provide comprehensive needs of poor and widowed women and orphaned/ abandoned children. - Establish programs and infrastructure to meet the physical, psychological, and spiritual needs of expectant mothers who have little or no family or social support. - Establish homes for unwanted children. - Provide immediate and long term needs of women and children affected by natural disasters. - Support other organizations involved with similar goals and objectives as this Trust. Plan activities and instructional programs designed for spiritual development and growth. - Design programs to preserve cultural and family values. - Teach and promote effective parenting skills. Establish parenting training centers for mothers and expectant mothers. Promote vocational training and provide equipment for general training centers, cottage industry training, day care centers, etc. - Promote and support rural developmental training for women. Provide and promote educational advancement with children’s schools, adult educational services, computer training, scholarship funds, etc. - Sponsoring the renovation and the rebuilding of schools and education centers that have been devastated or destroyed by natural disasters. - Running and supporting schools in Uttarakhand to provide basic necessities to their students so that children can not only survive but truly thrive. - Enhancing educational curricula to include messages of wellness, green living and improved water, sanitation and hygiene. - Sponsor over 20 poor children to get quality education. Provide programs for holistic healthcare. Support research intended for advancement of women and children’s healthcare concerns, particularly debilitating diseases such as HIV, AIDS, breast cancer, etc. - Support other organizations involved with holistic healthcare and research designed primarily for women and children. - Support programs for public health maintenance including preventative holistic health, basic hygiene instruction, nutritional counseling, Ayurvedic cooking instruction, etc. Raising mass awareness, especially among women and children, so that they can be the Green Ambassadors in their communities. - Promoting green and eco-friendly mass pledges and commitments to reduce our individual and collective carbon and water footprint. - Advocating about the significant and prominent environmental impact of living a Vegetarian lifestyle. Protection and preservation of all life including animals with a commitment to prevent animal killing and cruelty wherever possible. - Promoting a Vegetarian lifestyle as the single greatest and most powerful choice one can make to protect all animals. H.H. Swami Chidanand Saraswatiji’s motto in life is, “In the Service of God and humanity.” He left his home for the Himalayan jungles and forests at the tender age of 8 years, under the guidance of his spiritual master, in order to live a life devoted to God and in the service of humanity. Today, he is world renowned as a spiritual leader, visionary and divine guide. 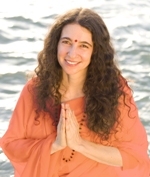 Sadhvi Bhagawati Saraswatiji, Ph.D was raised in an American family in Hollywood, California and graduated from Stanford University. She was completing her Ph.D. when she left America in 1996 to come and live permanently at Parmarth Niketan Ashram in Rishikesh, India. She has been living there ever since then, engaged in spiritual practice and dedicated service. 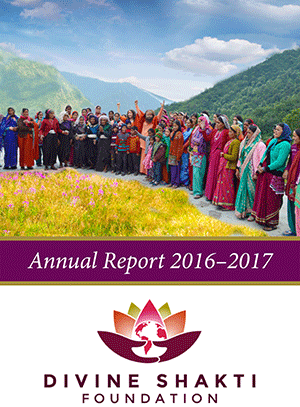 Read about Divine Shakti Foundation's work over the last year, including events and projects.